The Charlotte 49ers men’s soccer team defeated Winthrop 4-2 on Sunday night at Transamerica Field to win its own Nike Invitational for the second consecutive season. The 49ers (4-1-1) took a 3-0 lead over the Eagles before allowing two late goals by Winthrop. A late Jennings Rex goal sealed the victory for Charlotte. The game seemed out of reach for Winthrop until Matthew Skonicki struck a goal in the 76th minute to cut Charlotte’s lead to 3-1 and then added another goal five minutes later. Rex's goal one minute later put the game back out of reach for the Eagles. 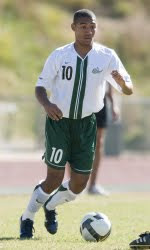 Rex was among four Charlotte players named to the 2009 all-tournament team. Evan James was named tournament MVP joining Rex, Charles Rodriquez and Jason Hawes on the team.